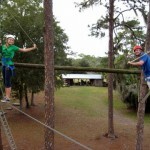 Common Ground Adventures can build virtually any High Ropes Element that your organization needs. View a sample of our most popular elements along with the values that participants gain below. 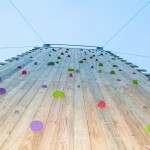 Climbing Walls, which can support one or two simultaneous climbers are a tried and true, traditional High Ropes Element. Marked routes allow participants to accept a higher challenge level when appropriate. A Vertical Playpen is comprised of a series of difficult to climb obstacles. Participants must scale each obstacle to reach the top. 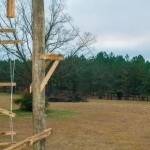 Obstacles may include tires, cargo nets, rope ladders, or other custom elements. Double Vertical Playpens allow two participants to ascend the playpen at the same time. These elements can be built to encourage co-operation between participants or to put them in friendly competition. The Duo Dangle pushes participants to completely rely on each other to achieve success. Two participants attempt to ascend a series of increasingly distant wood beams. Without each other’s support, they can’t reach the top. One of our most iconic elements, the Leap of Faith challenges participants to climb to the top of a telephone pole and take a flying leap into the air, trusting their team for support. We offer Leaps with either a trapeze or a ball as targets. 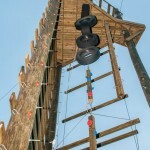 Zip Lines provide participants with a thrilling ride that is often a reward for climbing to the top of a Climbing Wall, Duo Dangle, or Vertical Playpen. Horizontal Traversing Elements can be installed in poles or trees as single elements or as part of a large static course. Participants attempt to traverse from one post to another using a series of wires, ropes, logs, swings and other objects for support. MultiVines are a type of horizontal traversing element. Participants walk along a cable while reaching from vine to vine for support. Each vine grows further apart, allowing participants to push their limits. Our Course Design page explains how we select the best elements for your organization. For information on the equipment necessary to operate your new High Ropes Course, visit our Equipment page. 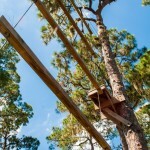 We can also train your staff members to operate your High Ropes Course. Our High Ropes Facilitation page contains that information.